Toshiba is taking a half step towards jumping on the Haswell bandwagon with the launch of its new range of laptops. 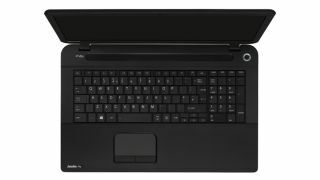 The Satellite P models at the entertainment market are equipped with the new Haswell CPU from Intel, but Toshiba is being more conservative with the business models in the Satellite Pro series. The Satellite P Series include Intel's 4th-generation Haswell processor and NVIDIA graphics, which are upgradable from 1GB up to 2GB VRAM. It is touting the P70, which features a 17.3-inch screen and Harman/Kardon stereo speakers, as a media-focused desktop replacement. Other new models, the P50 and P50t, have a 15.6-inch edge-to-edge touchscreen with 10 point touch and swipe, alongside hard drive storage of up to 3TB. The new Satellite P Series models start at £599 for the base configuration and are available from the third quarter of this year. Toshiba has stuck to Intel's 3rd generation Core processors and 7200 rpm hard drives for the new models in its Satellite Pro range for business users. Powered by Windows 8 (with the option of Windows 7), the new Satellite Pro L and Satellite Pro C models come in 15.6-inch or 17.3-inch sizes and feature non-reflective HD+ screens with LED backlighting. Both models feature onboard Intel HD graphics as standard, with the option of upgrading to NVIDIA's GeForce 710M (with 1GB VRAM) or GT740M (2GM VRAM) discrete graphics chips. Connectivity wise, the devices house a Gigabit LAN port with a/g/n WiFi connectivity, Bluetooth 4.0, USB 3.0, USB 2.0, and a 2-in-1 card reader. They also feature Toshiba's Split Screen Utility, which the company says makes the most of available screen space by automatically arranging multiple active files to streamline multi-tasking and improve productivity. The Satellite Pro L and Pro C series laptops start at £499 for the base configuration and are available from the third quarter this year.